Handy Man is one of Dribble and Spitz's microgames in WarioWare: Twisted! The player has to squeeze all of the items found in this game. To do so, he or she has to move a hand using the Game Boy Advance's tilting ability and press the button when it is behind the object. If done so, the game is won. However, if time's up and an item is still not squeezed, the player will lose. 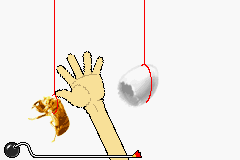 1st level difficulty: There will be an eggshell and a cicada shell (a rice ball can also appear in place of one of them in the Japanese version). 2nd level difficulty: There will be a dragonfly flying across the screen. It becomes a bamboo-copter when squeezed. 3rd level difficulty: There will be two tadpoles swimming up and down underwater. They become frogs when squeezed.